I hope you have already , or are planning to, make your way down to the new Moor Market – the first market to be opened in the UK in 10 years – and Sheffield have done it! I couldn’t help feeling humbled when I visited yesterday; the cavernous space is elegant and reminiscent of the Millennium Gardens in terms of its shape, it is decorated with huge modern wall freezes and, most importantly, it is warm. What humbled me most was not the great space (and it is great), but the gargantuan human effort and good will put into getting this place up and open on time – the builders and planners and council workers who have pushed and pushed for this building to go up – the press and the people of Sheffield who have kept this project on the top of the agenda must all be noted. But for me, it has to be all about the traders. The stall holders who came from Castle Market traded all the way up to Saturday tea time, and then worked like crazy to be open and ready for business on the other side of town 36 hours later. Presumably they had to put aside any mixed emotions to do with the closure of the old hall, and just focus on Monday morning at 10.00. 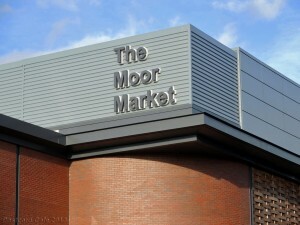 The stalls in the Moor Market are fresh and new – great displays, new signs and new uniform. So far this week the place has been heaving – and the traders were doing business. They were showing Sheffield what it means to be a market trader, to have your own business, to be master of your own destiny – calling out to customers, telling everyone about your product, there was a great buzz and they were creating it. The fresh produce available is amazing; meat and fish, fruit and veg – all at incredible prices; there is a cobbler and a watch maker, there are stalls selling fabric, there are nut stalls and sweet stalls. There is even a very small number of empty stalls tempting you to start that little venture you always wondered about. We started on the Continental Market, we traveled with them for a year, and it gave us the best grounding possible. We learnt how to attract customers when you are amongst a row of other market stalls, we learnt about location and the flow of customers, we learnt about pricing and menus, and most importantly we learnt how to think on our feet. As the saying goes – it is not if something goes wrong, it’s when something goes wrong, and you can’t stop serving customers – I remember opening the hatch at Cardiff Continental Market to a queue of people, and the tortilla press breaking. Quick as a flash, Richard organised the hot water boiler so that we could steam the tortillas on the top. we didn’t stop serving for 10 hours, 3 days in a row. Being back in the market environment has been invigorating for us, we are trading with the Pop Up Pantry a cluster of four stalls in the centre of the market available for daily hire – we have booked a stall Monday to Wednesday each week in the run up to Christmas. We saw this as a great opportunity to show case our food to a huge number of customers, we have developed a new range of express burritos filled with Mexican sauces especially for the market – Cochinita Pibl is a warming pork stew and Beef Mole is made with the traditional sauce mole, using many ingredients including cocoa. Today’s tomato soup went very quickly, but not as quick as our pork scratchings. You’ll have to get there before midday to get hold of them! Also to be found at the Pop Up Pantry will be Birdhouse Tea Company, Seven Hills Bakery, Carribean Fusion, Sapori, #brownies, and there are still a few spaces available. Overall, Rich and I hope that the blend of the old and the new found at the Moor Market will inspire more Sheffielders to set up their own small businesses. If anything, that would be my final observation about the atmosphere in the market – market traders are can-do people – you have to be, no one else will do it for you. The Moor Market built by Sheffield City for the people of Sheffield is an awe-inspiring example of what can be done, even in these times of austerity. I urge you to get down there, to shop in the market and on the Moor, and may be even set up that little business you’ve always wondered about…….